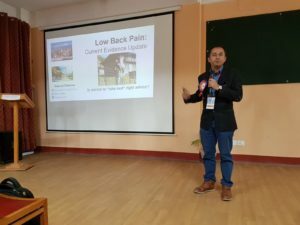 I flew to Nepal last week to deliver an invited talk on “low back pain- update” at Nepal Physiotherapy Association Conference (NEPTACON 2018). I received an overwhelming response: houseful presence, many questions, request to conduct longer sessions demonstrating how to educate/reassure patients with low back pain. Although I requested for an hour session, due to limited time the conference had, I squeezed the content to a 20 minutes presentation by delivering key concepts, and referring attendees to the key references. I am sharing the abstract that was published in the conference book with the list of key references in this blog post. I will be happy to answer any questions the readers may have. Enjoy reading the references. Almost everyone experiences low back pain (LBP) once in a lifetime. It is the number one cause of disability in Nepal and elsewhere. It accounts for huge direct and indirect costs to the individual and society. The burden is predicted to increase in the future especially in low-income countries including Nepal. There is an urgent need for utilizing guideline-based treatment for LBP in Nepal. More than 95% of LBP have no obvious causes, therefore, termed- non-specific LBP (NSLBP). Specific causes such as fractures, infections, or tumors, although rare are important red flags, which require thorough screening, and or investigations. They are medical emergency, therefore, should be referred to medical professionals urgently. Many guidelines exist on the assessment and treatment of non-specific LBP. For example, core-outcome sets recommend the use of patient-reported outcomes (PROs) such as measures of pain intensity, physical function, and quality of life as a minimum requirement for assessment in LBP. Assessment of psychological functions are also important. Recently, these measures have been cross-culturally adapted into Nepali and have shown to be reliable and valid, therefore, using them is a good start to improve patient-centred care/ research in LBP in Nepal. However, users should remember that Nepalese report more errors when using numerical rating scales, therefore, verbal rating scales could be a better alternative. Similarly, consideration of use of brief scales may reduce participant burden, but may compromise content validity. Similarly, clinical practice guidelines from developed countries have consistent recommendations for its treatment. Unfortunately, these recommendations have not been used in Nepal. Most treatments that are currently being used in Nepal for the management of back pain, for example, electrotherapy, bed rest, lumbar corsets, ergonomics, advice on posture are not evidence-based. On the other hand, intervention consistently recommended by all clinical practice guidelines, such as education are either rarely or wrongly used. As educational interventions are developed in and for developed countries, cultural and language barrier also limit its use in the clinical practice in Nepal. Therefore, every physiotherapist or professionals involved in the management of LBP should update their knowledge on evidence-base especially relating to pain science, contributors of LBP, prognosis, prevention and treatment. Most NSLBP reduce or resolve within 2-6 weeks provided optimal physical and mental wellbeing during the recovery time. This could be attributed to good sleep, continuing physical activity and work, maintaining positive mental state, reducing stress etc. Recurrent episodes or future episodes of NSLBP could be prevented by education and exercise. There is lack of strong evidence on which form of exercise is better than other, therefore, these choices should be discussed with the clients. An exercise that a patient would love to do or adhere to would be the best exercise for him/her. Aerobic and strengthening exercises are good exercises not only for LBP, but also for other co-morbidities, therefore, these should be incorporated in the exercise regime routinely. Conclusion: LBP is a public health concern in Nepal and elsewhere. Utilizing recommended assessment, prevention, and treatment of LBP should be the number one priority of the multidisciplinary team involved in its management. Clinical implication: The burden of LBP may be reduced by adapting prevention strategies, implementing guideline-based care by multidisciplinary clinicians involved in treating LBP. Saurab Sharma is a musculoskeletal physiotherapist, a researcher, and an Assistant Professor at Kathmandu University School of Medical Sciences, Nepal. He is currently pursuing his PhD at University of Otago, New Zealand. He has cross-culturally adapted more than 12 outcome measures in Nepali with five papers accepted or submitted, and other four in preparation. He serves as the editor of the blog linkphysio.com to promote evidence-base in physiotherapy especially in the area of pain management in developing countries. He is an active promoter of evidence-based physiotherapy in Nepal. Hartvigsen J, Hancock MJ, Kongsted A, et al. What low back pain is and why we need to pay attention. Lancet. 2018. Foster NE, Anema JR, Cherkin D, et al. Prevention and treatment of low back pain: evidence, challenges, and promising directions. Lancet. 2018. Buchbinder R, van Tulder M, Oberg B, et al. Low back pain: a call for action. Lancet. 2018. Bernstein IA, Malik Q, Carville S, Ward S. Low back pain and sciatica: summary of NICE guidance. BMJ. 2017;356:i6748. Toward Optimized Practice (TOP) Low Back Pain Working Group. Evidence-informed primary care management of low back pain: clinical practice guideline. 2015; http://www.topalbertadoctors.org/cpgs/885801. Qaseem A, Wilt TJ, McLean RM, Forciea M, for the Clinical Guidelines Committee of the American College of P. Noninvasive treatments for acute, subacute, and chronic low back pain: A clinical practice guideline from the american college of physicians. Ann Intern Med. 2017;166(7):514-530. Bardin LD, King P, Maher CG. Diagnostic triage for low back pain: a practical approach for primary care. Med J Aust. 2017;206(6):268-273. Maher C, Underwood M, Buchbinder R. Non-specific low back pain. Lancet. 2017;389(10070):736-747. Steffens D, Maher CG, Pereira LS, et al. Prevention of Low Back Pain: A Systematic Review and Meta-analysis. JAMA Intern Med. 2016;176(2):199-208. Almeida M, Saragiotto B, Richards B, Maher CG. Primary care management of non-specific low back pain: key messages from recent clinical guidelines. Med J Aust. 2018;208(6):272-275. Chiarotto A, Deyo RA, Terwee CB, et al. Core outcome domains for clinical trials in non-specific low back pain. Eur Spine J. 2015;24(6):1127-1142. Chiarotto A, Boers M, Deyo RA, et al. Core outcome measurement instruments for clinical trials in nonspecific low back pain. Pain. 2018;159(3):481-495. Costa MCL, Maher CG, Hancock MJ, McAuley JH, Herbert RD, Costa LO. The prognosis of acute and persistent low-back pain: a meta-analysis. CMAJ. 2012;184(11):E613-624. Traeger AC, Henschke N, Hubscher M, et al. Estimating the Risk of Chronic Pain: Development and Validation of a Prognostic Model (PICKUP) for Patients with Acute Low Back Pain. PLoS Med. 2016;13(5):e1002019. GBD 2016 Disease and Injury Incidence and Prevalence Collaborators. Global, regional, and national incidence, prevalence, and years lived with disability for 328 diseases and injuries for 195 countries, 1990-2016: a systematic analysis for the Global Burden of Disease Study 2016. Lancet. 2017;390(10100):1211-1259. Thank you so much sir for this abstract. Will definitely go through the references.